Are you among the .001 people who know this wildflower? A real head turner, this one. It’s early, you’ve managed to get out, without doing morning chores. The black russian, Petra has been fed and walked (Success!) and traffic has been blesssedly light. So you’ve parked the truck, gotten your gear ready, lens cleaned and you’re on Nichol Road trail. It’s just 8 A.M. and all you can complain about are those nuisance spider silks that dangle across the trail and gently envelope our face. Lens cover is off, so your Canon has to be held lens down or it’ll get silked, too. Then there it is. 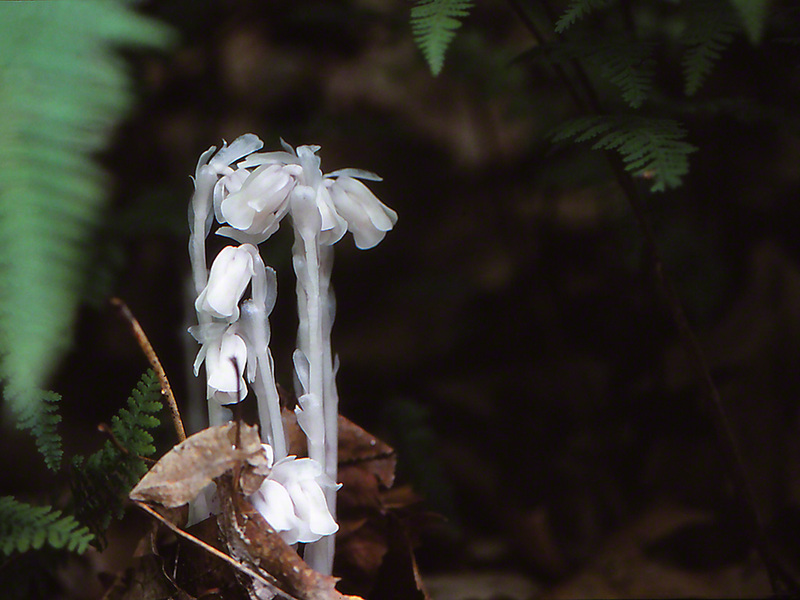 Monotropa uniflora. Are we on Mars? you ask. What is this thing? Is is a plant? Where’s the green? Are those things flowers? Answers = No. A saprophytic plant. Yes. No green. Yes. This woodland plant thrives in moist, mostly shady habitat. Yes, the National Audubon Society‘s Field Guide to Wildflowers identifies it as bearing flowers. Ever seen one like that before? Does it attract butterflies? I want to say no. No. Does it attract esthetes who hike by, seeking butterflies? I must say Yes! June to September, folks. A Zombie plant. Paula, you Like? Beautiful! I am so proud to say I know this plant! I first saw it only last week, and have several photos, but none of mine show the white as white as your photo does. I guess it’s because of heat and/or bloom time. I didn’t know it likes shady moist areas. Wish I’d known before b/c that’s mostly what my yard is like. Very nice find! (I discovered the plant through volunteering at the botanical gardens. We’re working on “curb appeal” and there’s some Indian Pipe growing out by the road. I think the dirt was brought in from another place so we’re going through the weeds).